Go to the Minute Clinic Facebook page to receive a unique coupon delivered to your email inbox for a FREE travel-sized sunscreen, available to you now before Minute Clinic extends this offer publicly on Thursday, August 9th. Then bring your coupon into any CVS/pharmacy by August 26 to choose one 2-oz. travel-size sunscreen. This offer valid in store only. Coupon expires 8/26/12. Not available in New York. One per household. Must be age 18 or over. 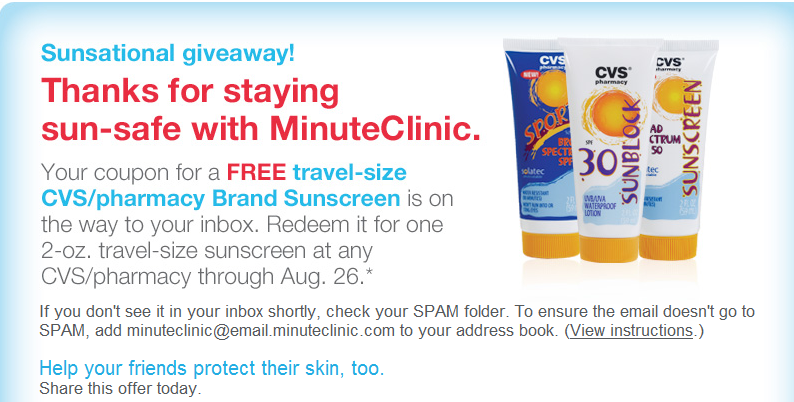 Make sure to check your SPAM folder if you don't see your email from Minute Clinic since my coupon ended up in my SPAM folder.